The blog acts as an engaging gateway for readers to browse and comment on whichever documents you choose to include in it; this blog/document integration makes it easy to get conversations going! Each blog post acts as an excerpt and link to an underlying NowComment document; your blog&apos;s readers can, with one click, go straight to the document and all its existing comments. 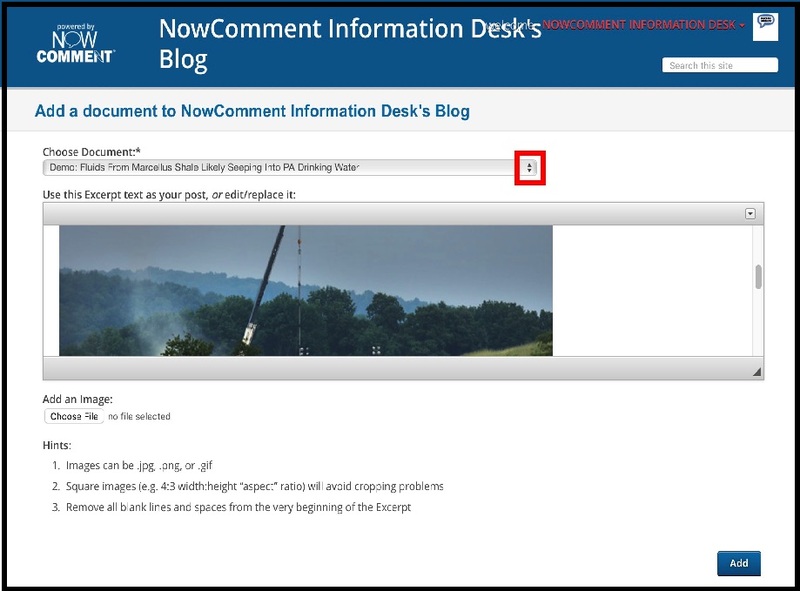 Having the full power of NowComment to do in-context video, image, and text commenting is a huge improvement over standard blogs, where all the comments sit at the bottom of the blog completely out of context. having your blog and your documents on the same site means one less site to maintain and to log in to. Personal blogs — only you can post your documents (and relevant Public Documents) to it. Group (often class) blogs — any member of the group can add their NowComment documents to the blog. The Group Administrator who creates the blog (often the course Instructor) can add or remove documents from the blog at any time. Both types can be either Public (anyone on the Internet can see and comment on the documents) or Private (only those you invite can see and comment). Private documents can&apos;t be added to a Public blog unless the Document Owner changes the document from Private to Public. where you use the “Choose Documents” picklist control (boxed in red in the screenshot above) to select the first document to include in your blog from an alphabetical list of all the NowComment documents you have access to. For a Personal blog this list will include your own documents and Public Documents you&apos;ve been invited to or Favorited; for a Group blog it will also include all the documents shared by members of the Group with the Group. If you&apos;re a brand new NowComment user and have not created a document or had one shared with you yet this list will be empty and you can&apos;t yet add anything to your blog. Once you&apos;ve chosen a document from the picklist, NowComment puts the first 2000 characters of your document into an editing field below the picklist as a default blog post about that document; you can edit or add to this default content whenever you wish. Those 20000 characters usually constitute the first couple text paragraphs of the document, but if your document starts with lots of HTML formatting then you may get less text in that default selection… and if your document starts with images and embedded videos then the default blog post may just contain images and videos! NowComment also lets you add an image to your post from this screen. When done, click the blue “Add” button and your first blog post is finished! The left column shows when your post was made and how many comments the underlying NowComment document has (no commenting is done on the blog post itself). If you see a problem, there&apos;s a blue “Edit” you can use to change your post… and an orange “Remove” button to take the document off the blog. Neither editing nor removing a blog post has any impact on the underlying document itself. That&apos;s all there is to blogging within NowComment; it really is a very fast and easy process! By clicking on a blog post&apos;s title, readers go straight to the underlying NowComment document and can read it and comment on it. Note: the demo blog created when making this documentation is here. Another demo blog is NowComment Pedagogy.